Ovulation Chart - Print or Download for Free! 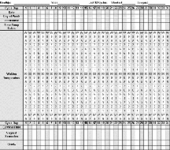 >> >> >> Ovulation Chart - Print or Download for Free! To prepare this chart need a basal thermometer able to show you the reasonably small changes in basal body temperature that are seen during the fertility cycle. To take a basal body temperature it is essential that the woman is well rested, that the temperature is taken before doing anything else in the morning (do not get out of bed) and that the temperature is taken at approximately the same time every morning. This is a resting body temperature. Getting up, moving around, emptying your bladder will all artificially raise your temperature reading and interfere with your ability to keep an accurate fertility chart. Record all of your findings on your fertility chart each day. For women with very regular cycles each month may look strikingly similar. For women with irregular cycles a wealth of information may be gathered from serial fertility charts. Some fortunate couples may find out that their main problem was simply one of timing. Others may be able to eliminate timing as the major cause of their infertility. To print or save the Fertility Chart of Basal Temperature, please click HERE! Also to have second opinion, you can use another type of Ovulation tests, like urine LH testers or Mini-Microscope QTEST for saliva testing.